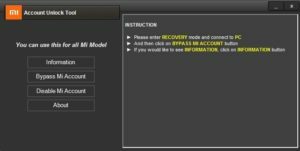 This is very straightforward tool just you need to download this tool, after that install it on your computer, and put your device into recovery mode to unlock Xiaomi redmi phones. How to Use Mi Account Unlock Tool? It’s the instrument to remove or Bypass Mi Cloud verification when You forget Mi Account Login & Password. By utilizing this tool you are able to Bypass Mi Account or Disable Account. All these are the only two services are available in this program. At any time you Reset your device, On the first boot, we have to put in the Login of Past Mi Account ID without entering the details you can’t use the apparatus. Now, to Bypass that we have two options, First would choose to overlook password and regain the logins or if you did not recall the exact ID then you can use this instrument to Bypass Mi Account or Disable Mi Account choices. Hard resetting your device using this toolkit is extremely straightforward. You will need to boot your device into a Recovery mode that will boot your apparatus into PC Mode. Here is the quick guide to begin with this tool. 01. If you have antivirus installed on the pc then please turn off it prior to drawing. 02. Open the extracted folder & Run”MiAccountUnlock Tool.exe”. 03. The application will open your display. Reboot your device into Retrieval Mode, First Switch off your Phone. Now, Press Volume Up Button + Power On button both at the same time & maintain them till you see Mi Logo or pcsuite.mi.com. 04. Connect the smartphone Utilizing USB Cable to the PC. 05. In the tool, Click on info to assess whether your device is connected or not. You will see the information of the connected telephone. In case it didn’t demonstrate any advice that means its recognized from the tool. Go back and install appropriate USB passengers again. 06. Eventually, Press”Bypass Mi Account” to eliminate cloud verification or Xiaomi FRP Lock. 07. Don’t Plug-out the device before the unit is not startup correctly. Also, Do not link to the internet till you’ve booted to the primary display. Are you still didn’t knowledgeable about the use of this app, Don’t worry check out the brief video about How to Factory Reset Redmi 4/4A/4X using this little application. This was the overall process to Bypass Xiaomi FRP Lock & Post for Mi account unlock tool free download. If this article is grateful to you then reach that share buttons to discuss on social networking. Also, do comment in case you have any uncertainty related to this. Download Mi Account Tool for free. You will get here the latest version to Bypass Mi Account. Get Easy way to Bypass Mi Cloud Verification using this Tool.